In a second, you'll see a killer bartender resume example. You make the best cocktails. You’ve got style, and you’ve got flair. So, why do you need to care about making a professional bartender resume to snag your next gig? Well, bartending is becoming more of a career rather than a part-time job for college kids. So, are you serious about mixing the best drinks and serving the classiest clientele? Then you have to have the best bartending resume out there. But how is a bartender resume different from any old paper resume? It’s all about the skills and the shine - it’s about setting the bar high. A bartender resume example better than 9 out of 10 other resumes. How to write a bartending resume that will land you more interviews. Tips and examples of how to put skills and achievements on a bartender resume. How to describe your experience on a resume for a bartender to get any job you want. Here's a sample resume for a bartender made using our resume builder. Bartender Resume Examples - See more templates and create your resume here. 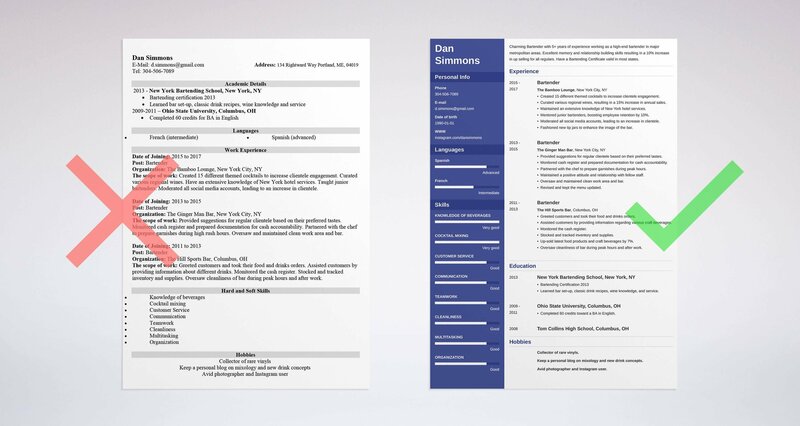 For most entry-level positions, the reverse-chronological resume format works best. Let’s say you’re a bartender with experience. You’ve progressed from a bar-back to a bartender manager resume. You’ve tended several bars over the years, and you’re a pro mixologist. Bartending is an entry-level position. So, you don’t need an impressive head bartender resume loaded with experience to land a job. Right? But bartender experience on a resume is guaranteed to give you an edge over the competition. So, why not put that first? Let’s say you’re applying for your first job ever. You have a resume with no experience in the service industry. Your experience section will look sparse, it’s true. So, lead with your education - even if you haven’t graduated yet. Then add non-traditional work in the space where your work history should appear. Pro Tip: Choose past experiences that have skills matching those you need for your bartending job. For example, let’s say you’ve volunteered at a soup kitchen. Well, you have customer service skills that translate to bartending. Bartender: Resume Summary or Resume Objective? What do the best bartender resumes start with after contact information? That’s right! With a resume objective or a professional resume summary. But which should you choose? You have 20+ years of experience slinging Singapore Slings at hotel bars. Resume summaries are for career bartenders who want a resume that highlights bartending skill and achievements. You were once a Financial Analyst now you want to make Moscow Mules. Your experience serving alcohol was grabbing beers for your dad during the Superbowl. Resume objectives are for career changers or entry-level bartenders. Use a resume objective to point out that who you are now can translate to who you want to be for the employer. Charming Bartender with 5+ years of experience working as a high-end nightclub bartender in major metropolitan areas. Excellent memory and relationship building skills resulting in a 10% increase in up selling for all regulars. Have a Bartending Certificate valid in most states. Potential Bartender seeking part-time position at Dirty Joe’s Dive Bar and Nightclub. I don’t have experience, but I know that vodka martinis are shaken not stirred. I am handsome and good at guessing ages. 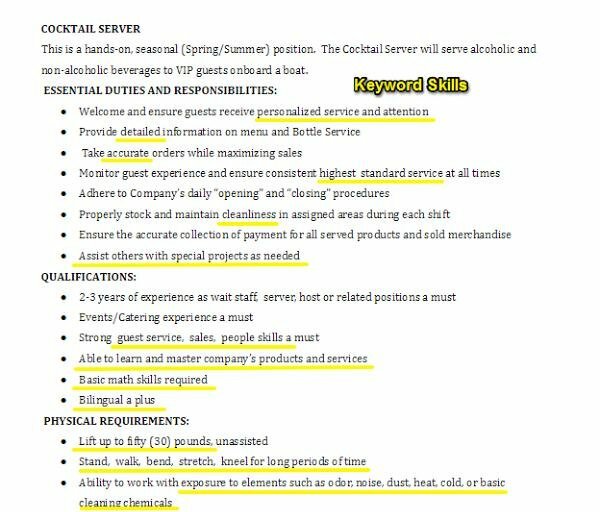 It’s not the best idea to write a bartending resume summary that highlights the fact that you don’t have bartending skills. Instead, go for a resume objective. Also, avoid the first person. Keep it about the employer. I am a mathematics graduate seeking a part-time job as a banquet bartender because I like alcohol, I need to get out more, and I need money. Unfortunately, no one cares what you need. Your bartending resume objective should tell the hiring manager you’ve got what they need. How do you know what they need? Read the bartender job description. Pro Tip: Always remember to choose adjectives from the bartender job description to describe yourself. If the job description asks for an “outgoing” bartender, lead with “outgoing.” That way, the hiring manager sees what she wants first thing. At the same time, if you’re the Silent Bob of bartending, don’t write “outgoing” on your sample bartender resume. Lying will backfire at a later date. If you’re an experienced bartender, lead with your experience. Put your experience section under your bartending resume summary. Underneath each job, add up to six bartender responsibilities. Your lead bartender resume duties should include skills found in the job description and quantifiable achievements. Curated various regional wines, resulting in a 15% increase in annual sales. 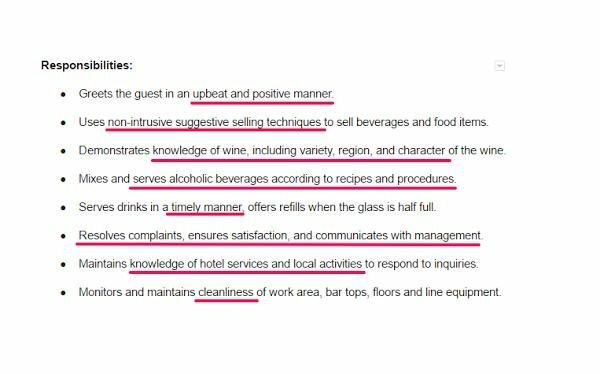 The job seeker above has mentioned both a “knowledge of wine” and an extensive knowledge of “hotel services and local activities.” Both of which the hiring manager asked for in the bartender job description. Responsible for serving beer to customers. Responsible for wiping down bar. The job seeker above uses “responsible for” three times. Yawn. Also, avoid mundane bartender responsibilities. Add achievements that show off bartender skills instead. Notice the addition of bartending achievements in the right example. Problem: There was a dip in regular customers due to lack of imaginative cocktails. Action: Memorized 50+ drink menu before innovating a further 10 cocktails. Result: Boosted the number of regulars who come to the bar often. Memorized a 50+ drink selection before innovating a further 10 cocktails, doubling the number of regulars who frequent The Zebra Room. If you have no experience, you can still add an experience section. You only have to be more creative about what you add. Provided customer service for clients visiting the office. Served hot beverages and shared knowledge of hotel services and local activities. Monitored cleanliness of the office kitchen and other facilities. Memorized and organized filing system for transition to digital storage. Here the job seeker has chosen duties from her internship that match the bartender resume duties from the job description. Note, these may not have been her primary duties at her internship, but they are the most relevant to the job on offer. She throws in transferable skills as well - memorization and organization. Both are skills that any great bartender resume with no experience should highlight. Pro Tip: Let’s say you’ve had several short time gigs at bars where you worked for less than a year. You don’t want to come off as a job seeker with itchy feet. Only select relevant jobs to avoid looking like a job hopper. Education isn’t mandatory for you to serve drinks to thirsty customers. In fact, bartending is often a job that college students hold while finishing up a degree. Only have a high school degree? 2005 -2007 Completed 60 credits toward a BA in English. Let’s say you finished bartending school. You’ll want to add it to your bartending resume first before your other, formal education. Learned bar set-up, classic drink recipes, wine knowledge, and service. You’ll want to put your licensure above whatever school you finished. Put your high school on your entry-level bartender resume unless you’ve finished college. Pro Tip: If you finished a semester or two of college, put it on your bartending resume. You paid for those credits, and they belong to you. You can also add a coursework description to showcase relevant knowledge or skills. For bartending, basic math or communication classes would shine. For a cool bartender resume, skills are king. But you will also want to tailor your bartender skills to match those from the bartender job description. It’s best to go through your bartender job description and highlight all the skills and experience related to the job that you have. Next, you’re going to group the bartending skills into one of three categories. The job-related skills are arguably the most important because you can’t do the job without them. From looking at the bartender/server job description above, the physical requirements qualify as job-related. Can lift up to 50 pounds and resilient when exposed to different elements. Next, you’ll want to focus on your transferable skills. These are skills that can translate from one job to another. All the bartender skills in the “qualifications” section of the bartender job description are transferable. Excellent math skills - can calculate all basic math functions without pen and paper. Speak and write in fluent Spanish. Finally, adaptive skills are those soft social skills you need to get along with other people. They’re often the adjectives in the bartender job description. You can add a few to your bartending resume objective or summary. Put a few in your experience and education sections. Detailed-oriented and accurate with large amounts of information. Strong teamwork and people skills. Keep in mind that you will want to add some details so that the hiring manager gets a better idea of what you can do. For example, the first job seeker writes, “Can lift up to 50 pounds.” That’s more than the bartender job description asks for and the hiring manager knows what the candidate can manage to lift. Strong what? What does strong mean? The hiring manager doesn’t know. So, who would you rather hire? The bartender who can lift 50 pounds or the “strong” candidate? Pro Tip: You may have additional skills that the hiring manager didn’t ask for in the job description. Look at other bartender job descriptions that are similar. Do you notice repeating skills? If you have them add them to your bartending resume as well. Bartenders may want to consider adding extra sections to their resume. But it’s not necessary. All you need to do is show that you can serve drinks and provide satisfactory customer service. At the same time, you may want to consider adding a hobbies and interest section. Why? Because fitting in is important in such a social environment. Use your hobbies to reflect that you’re a match for the work culture and atmosphere of the bar. I have an in-depth knowledge of Rock and Roll and play the drums in a local band. I like playing chess and reading. Tailor your hobbies to the culture of the bar. Don’t add quiet hobbies to a Rock and Roll bartender server resume. Pro Tip: Just be careful not to make it seem like your passion will detract from your job. Spending hours at rehearsals means missing peak hours at work. You won’t want to mention this during an interview or draw too much attention to it on your restaurant bartender resume. But I’m going to be a bartender. What gives? If you’ve got to turn in a bartending resume for the position, assume that a cover letter needs to go with it. Also, use it as a place to explain your passion for mixing and serving drinks. Tell a story about how you'll be the best bartender they could hire. Don’t forget to tailor it to the job description. At the top, put a bartending resume summary or resume objective. In your work experience section, don't just list your duties. Focus on achievements. Avoid listing generic skills. Be specific. 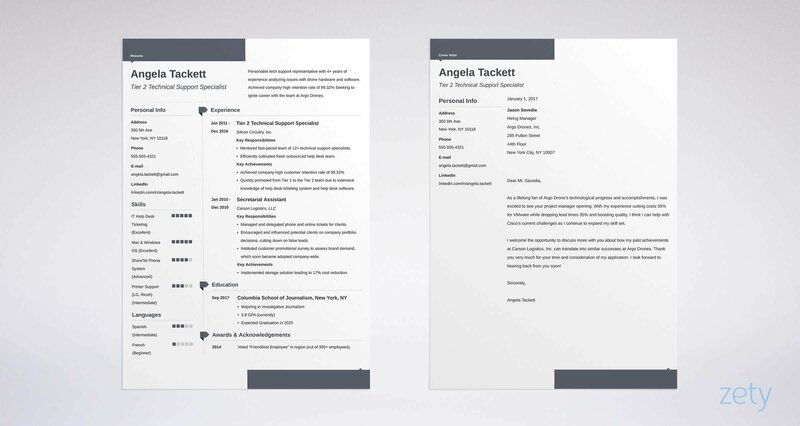 Customize every resume you send to match the requirements from the job ad. Still not sure how to write a creative bartender resume objective? Have questions about what bartender skills are best? Let us know in the comments, and we’ll help you out. Thanks for reading!